This photograph was taken in a fish market in Yilan, Taiwan and is now making the news. 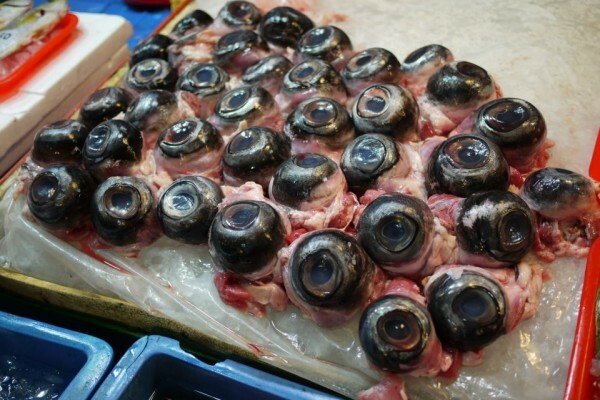 There is some debate as to whether these are tuna or swordfish eyes. Either way, Beel would give ’em a go. Fish eyes are commonly eaten in Japan and China. The ocular muscles, nerves, and fatty tissue are supposed to be very tasty. The eye itself reportedly tastes like squid, which is the aquatic version of saying it tastes like chicken. When eating (smaller) whole fish, it is customary to offer these tasty nuggets to guests or special persons. Beel is left wondering though, when eating such a large eye, as above, what do you do with the lens? It is a spherical, solid structure (kinda like a marble) and would be crunchy, munchy, and grainy if you chose to chew it. But who would? So, do you spit it out? Do you swallow it? What? 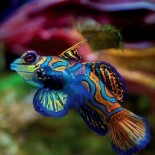 This entry was posted on February 5, 2013 by denstormer in Beel Bemused and tagged marine fish.